CicLAvia may be almost seven years old, and the over-the-top fanfare may have settled a bit, but the event is still a great way for Angelenos to engage with our many neighborhoods. CicLAvia is returning this Sunday for the third time in 2017. In March, we biked from Culver City to Venice, and in June we cruised from Glendale to Atwater Village. This time around we&apos;re heading south to the harbor area to tour Wilmington and San Pedro. For the uninitiated, CicLAvia basically means that a set of L.A. streets will be closed off to cars, allowing bicycles (and other people-powered doodads like skateboards and rollerblades) to take to the roads. It&apos;s totally free and you can join the route at any point. 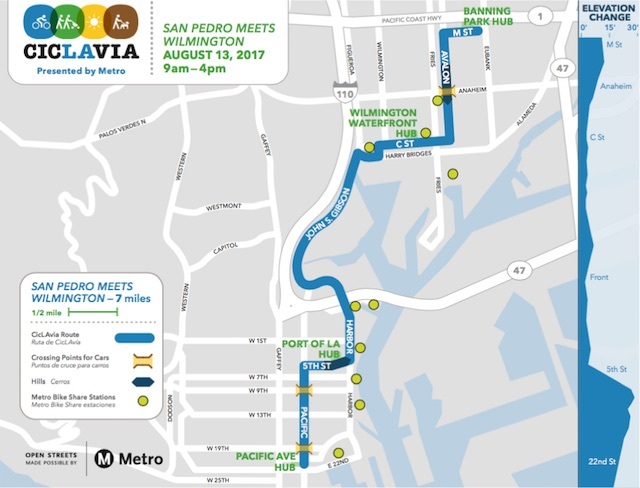 When: The event will go from 9 a.m. to 4 p.m.
Getting there: You can take the Metro&apos;s Silver Line bus down to San Pedro. If you&apos;re driving, you can leave your car at one of the several public parking lots that are operated by the L.A. Department of Transportation in the area. What&apos;s the weather like: The Weather Channel says that highs in the San Pedro area will hit a very agreeable 80 degrees on Sunday. You might not have to bring your own bike: In late July, Metro unveiled a new bike share program in the Port of L.A. area. There are currently 13 stations that stretch from Wilmington up north, to the Cabrillo Marine Aquarium down south. Wherever you are on the CicLAvia route, there should be a station that&apos;s not too far away. You can find them on Metro&apos;s interactive map. If you&apos;re itching to try out one of these bikes, you can purchase (with a credit card) a single 30-minute ride at one of the station kiosks for $3.50. You can also buy a monthly pass for $20 for unlimited 30-minute rides, or an Annual Flex Passes that costs $40 a year (with each ride being $1.75). Metro says that there are 120 bikes in total across the 13 stations. That&apos;s a lot of bikes, but we wouldn&apos;t be surprised if a single station runs out of bikes, so it&apos;s perhaps wise to bring your own if you have it. 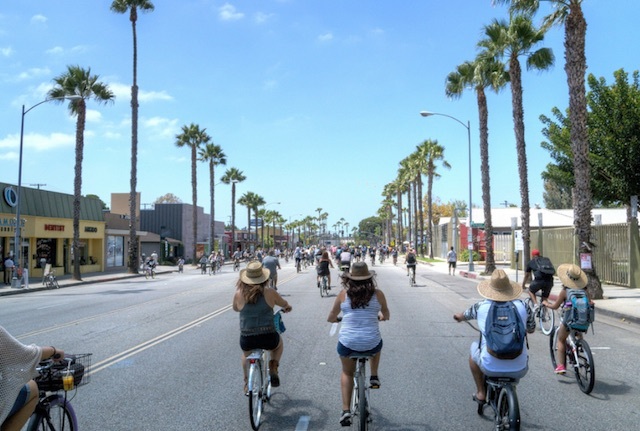 What to do: One of the strongest points of this CicLAvia (aside from it bringing you close to the water) is that the area is rich with attractions. There is, for instance, the Battleship USS Iowa, which has retired to become a museum, as well as the Los Angeles Maritime Museum, which has a cool exhibit about San Pedro’s fishing and canning industries (here&apos;s Huell Howser dropping in on the Maritime Museum in 1995). Also, the L.A. Waterfront Trolley (which is free!) will be running in a continuous loop near the route, passing by every 20 minutes. Per usual, The Militant Angeleno has drawn up an excellent list of things you should take note of along the route. Aside from the aforementioned museums, he&apos;s also named the Warner Grand Theatre (a prime example of Art Deco architecture) and the southern most tip of Figueroa Street (which the blogger notes is "the longest street entirely within Los Angeles City Limits"). Also, CicLAvia will have four activity hubs that will be situated along the way. There you&apos;ll find free water and basic bike repairs. At the Port of L.A. hub you can learn some skateboard skills from The Skate Side, who have a skating summer camp. If you&apos;re looking for something more...tame, at the Pacific Avenue hub you&apos;ll be able to "Relax in the AARP play zone while catching up over vintage board games"!